Gov. 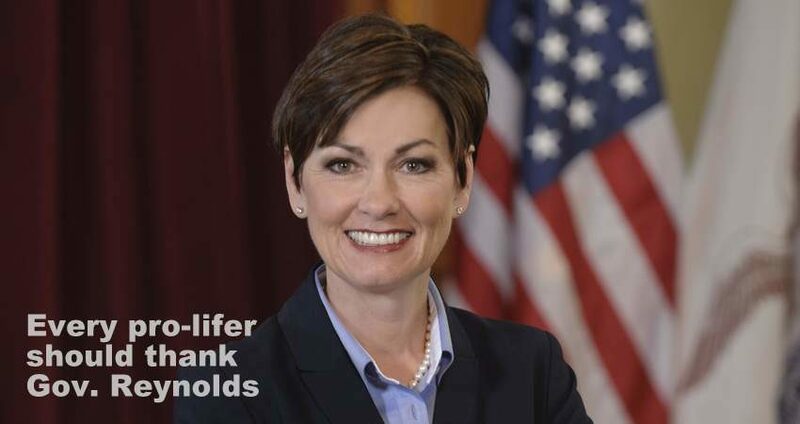 Kim Reynolds signed the Heartbeat Bill on May 4, a measure that will stop nearly all procured abortions in the state of Iowa. "If death is determined when a heart stops beating," said Gov. Reynolds, "then doesn't a beating heart indicate life? For me, it is immoral to stop an innocent beating heart." Planned Parenthood and the ACLU are challenging the bill in court. In fact, ACLU legal director, Rita Bettis, confessed to The Washington Post: "In the 45 years since Roe, no federal or state court has upheld such a dangerous law." Yes. The law is dangerous for Planned Parenthood, but life-saving for the unborn. “We know that our work is not done, that we must continue to work together to change the hearts and mind," said Gov. Reynolds. "...we’re not slowing down, we’re not going to stop. It’s a fight worth fighting." Thank Gov. Reynolds for her unusual courage and leadership. Thank you so much for signing the pro-life Heartbeat Bill. Your moral courage and leadership in defense of the unborn is deeply appreciated. Please continue to stand firm against the Culture of Death and may God bless you abundantly.